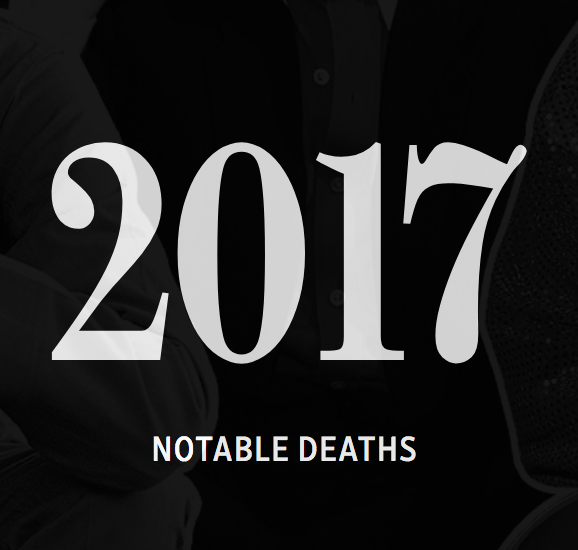 Have you noticed how it seems that almost no one is lamenting all the celebrity deaths in 2017, like they did back in 2016? In case you forgot, there were plenty of assessments of 2016 as the worst year ever. Yes, there were even a few hashtags (here too). But, as should be obvious, it’s not tough to employ an alternative set of criteria — say, one that saw Tom Petty as the superior performer to, well, have your pick from 2016’s various rock and roll departures — and, voila, 2017 is a candidate for the worst year ever. So what strikes me as interesting is thinking about the set of conspiring factors that led to the success of a 2016 narrative which seems to have disappeared in 2017. If so, then perhaps the election of Donald Trump and reports of what many in the US electorate see as his sometimes unorthodox behavior as President, may have stepped in as the new vehicle to drive much online traffic. After all, as sad as it might be to baby boomers to lose David Cassidy or Della Reese, each day’s news in 2017 was already bringing (at least for these people) shocking headlines and possible scandals to occupy their attention for the next 24 hours — suggesting that focusing on the inevitably mounting list of annual celebrity deaths no longer served the function that it once did. That’s just one hypothesis, of course — I’m interested in what you think: why did the #2016worstyearever itself become an historic artifact? For, despite predictions, 2017 seems not to have stepped up to repeatedly earn this honor. Previous PostPrevious Looking for a Thesis Topic? Next PostNext I Saw the Sign, or Did I?